Sifting refers to a series of intimate gatherings that I facilitated at The New School. These gatherings explore paper-making as a metaphor and embodied practice, useful for thinking about institutions of education and knowledge. Paper-making workshops for graduating seniors were held at various locations: my apartment, the school courtyard and classrooms. Students were asked to bring paper which represented their experiences, feelings and anxieties related to academia. Together we tore up these documents, processed them into a collective pulp, and reformed them into blank sheets. These processes provided prompts for reflecting on our education and discussing how to re-form and build off of our existing knowledge in the years to come. Each participant took home the paper they made. 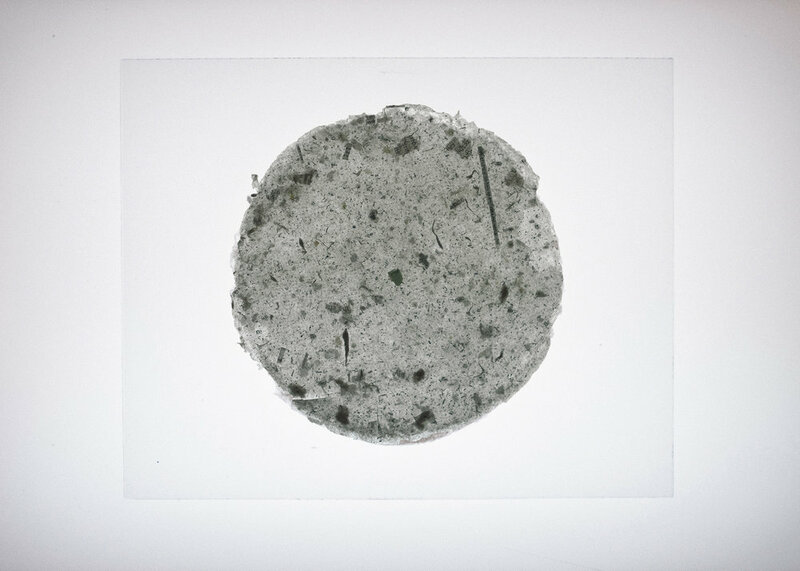 One piece of paper from each workshop was pressed between glass, mimicking the presentation of an object that should be further researched and studied. This project is an ongoing form of Artistic Research, asking the following: How can I use an institutional project to serve and benefit my individual needs? How can a thesis be the “anti-thesis” (collective instead of solitary, intuitive over predefined, expansive instead of specific)? How can a “thesis” be used to comfort, decrease stress and pressure created by the expectation of writing and creating a thesis? How can a manufacturing process be embodied? How can feeling be making? How can making be researched? How can research be felt? How can research be made? How can research be researched? Contents of paper: Photos and misprints of past projects, psychology readings on emotion and memory, drafts of thesis papers, papers from past internships, photos of boxing, hair, Halls cough drop wrappers..
Collaborators: Lexy Ho-Tai, Bria Blunt, Alexa Seiler, Domenica Gallinatti and others.